Charming, mop-headed hummocks of yellow-striped leaves add vivid splashes of colour to the Grass Garden this month. A native of Japan, the species naturally inhabits woodlands, frequently in mountainous locations. 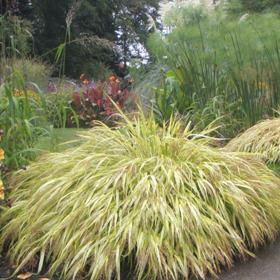 This handsome grass could liven up a shady rockery or woodland, or soften hard edges to paths or steps. Planting alone in a minimalist container could have equally spectacular results. A number of ornamental cultivars of the species exist, most notably ‘Aureola’, which holds the RHS Award of Garden Merit.